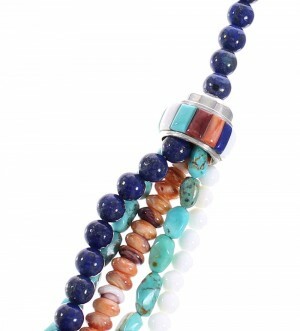 Sterling silver, real Turquoise, Lapis, White Agate, White Inlay, along with Orange, Purple and Red Oyster Shell. 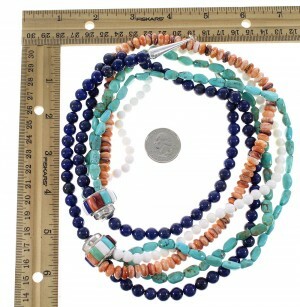 Necklace measures approximately 32-1/8" long and weighs 209 grams. This lovely necklace is a work of art and has everything you could possibly want from a piece of Native American jewelry! This piece of Native American jewelry is Navajo hand strung out of genuine sterling silver, along with real multicolor beads, and multicolor inlay beads. 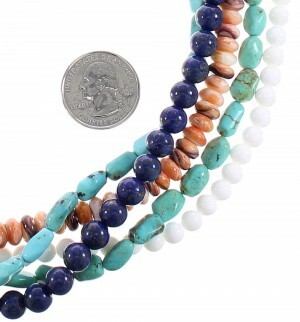 The necklace is made up of FIVE strands that consist of: 6-mm White Agate round beads, 8-mm Lapis round beads, 8-mm Purple and Orange Oyster Shell rondelle beads, and Turquoise beads that have an average measurement of 7-mm. 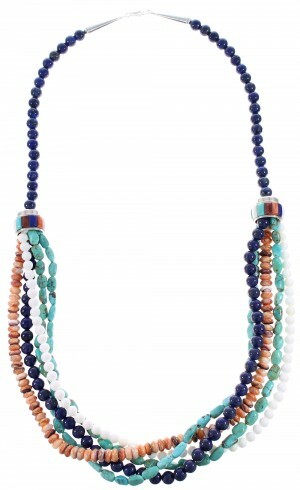 The FIVE strands in this necklace are being held together by TWO 21-mm multicolor inlay divider beads that consists of: real Turquoise, Lapis, White Inlay, Red and Orange Oyster Shell. 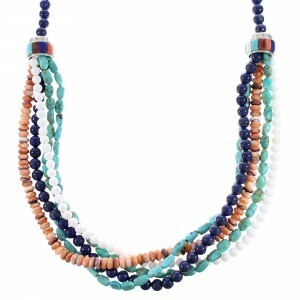 Each end of the necklace is completed with a silver bead and cone for an elegant finish. The cones are stamped sterling.